As a service and convenience to NASBP members, affiliates, and associates, NASBP is providing the following information about the new, revised American Institute of Architects (AIA) Bond forms, AIA A312 Performance Bond and Payment Bond and the AIA A310 Bid Bond. 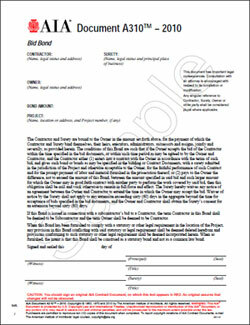 In June 2010, the AIA released the updated AIA A312 Performance Bond and Payment Bond and the AIA A310 Bid Bond forms. Click here to see the press release released jointly May 25, by NASBP, SFAA, and AIA announcing the new forms. NASBP participated in the AIA-led industry-wide collaboration to update the AIA bond forms, which was the first update of these forms since 1984 and 1970 respectively. In 2010, NASBP jointly held with the Surety & Fidelity Association of America a virtual seminar on the revised AIA bond forms. An audio recording of that seminar is available for purchase to help surety professionals to become familiar with the specific updates to the forms and their significance to owners, contractors, subcontractors and surety professionals. To purchase the audio recording, click here. The $65 includes the audio file, sample copies of both forms, a presentation outline and the publication, "AIA Bond Form Commentary and Comparison," that provides a concise summary of the changes to the forms.